What if one gets hooked for life to a single object? What if it pursues you despite age, experience or time? Vinu Kolichal’s Bilathikuzhal (English Barrel) is about such a man and the obscure object of desire, which, in his case is the barrel gun. In the film, Kunjambu is the child/man obsessed with the barrel gun from childhood to old age. We see him only as a child and as an old man in the film. Obviously, things have happened in between around him, from an adolescent he had grown into a youth and bred a family, as he is a grandfather when we see him. Likewise, the world around him too has moved on, from a feudal agricultural economy to one which has become ‘modern’ – where we find people engaged in secular professions, and institutions like police station, grocery shop, and bus transport. But the child in him never ‘grows’ out of the primal obsession that pursues him despite himself and the world. The film is structured in two halves, his childhood and old age, which mirror each other in many ways. Significantly, his ‘active’, ‘adult’ life in between is left out; it is rather an absence or something irrelevant or dream-like compared to the reality of his obsession. In fact, nothing ‘happens’ in the film, there is no conventional ‘storyline’ with a definite beginning, middle and end, or any dramatic turn of events. But its layered and engrossing images invite the viewer in to a contemplative mood, where space and human life are elaborated in all its organic persistence and complex sustenance. In the first half, we see Kunjambu, a village boy obsessed with a gun in the possession of Chindan Muthappan, his neighbour. His admiration and imagination are embellished by folk songs and legends about his adventures and exploits and his own dreams and fantasies about them. His infatuation is finally acknowledged by Muthappan who teaches him the basics of the gun and shooting, which is where the first half comes to an abrupt end. In the second half we find an aged Kunjambu, who is withdrawn and silent, living with his sons and their family. Only activity he is engaged in is going to the police station every day to reclaim his gun, which was deposited during the elections. But his waiting is of no avail and only triggers ridicule among all. Decades separate the two halves of the film, but Kunjambu’s obsession persists in all its intensity through time and generations. If it was wonder and admiration earlier, it is endless but relentless waiting now. The visual composition of the film poignantly captures Kunjumbu’s state of mind that is internally restless and pining while remaining calm and placid on the outside; a child within an aged body. The film is shot predominantly in long takes and in deep focus with the foreground, mid-ground and background in full view. The characters inhabiting the space, their actions and movements and their physical surroundings teeming with everyday chores all form part of the mise en scene. It is this contemplative and detached view that gives the film its peculiar charm and intensity. The tragedy of desire unfolds through the dynamics between the fore, mid and backgrounds, in and through their composition, proportion and inter-relationship. It is not through overt and visible action/acting that the human drama is created but through the dynamics of juxtaposition of the inner state of mind and the world outside immersed in diverse everyday activities unfolding in the different grounds within the composition. Almost all the scenes are static, long shots in deep focus often mid-grounding the central characters. But, being static doesn’t mean still or inactive. In most compositions, whether interior or exterior, the mise en scene is organised and layered in such a way that activities/actions happening in the different grounds are kept in view triggering narrative pulsations in the viewer. Take for instance the interior scene where the sons hovering around their father, irritated by his pestering the police every day about the gun. Shot from the dining room with the table in the foreground, we can see the midground where the eldest son is uneasily flipping through a magazine with his adolescent daughter squatting on the ground doing her homework. In the background is the veranda where the other son is restlessly pacing. The old and aged Kunjambu is seen slowly eating dinner; his eldest son is fiddling with the magazine and fuming within, while the day-to-day life in the house flows around incessantly. Likewise, the outdoor scenes of the grocery shop run by his younger son are also framed in such a way that the surroundings and depth of field are maintained, opening up different layers of landscape where different activities unfold. In another scene, we see the young Kunjambu hiding behind the ridge of the expansive paddy field, watching the arrival of the policeman into the village and later, his departure with Muthuapan. The shot is composed in such a way that the whole sequence of events unfold without the camera moving, while things unfold in sequential flow of time and in different fields of space. 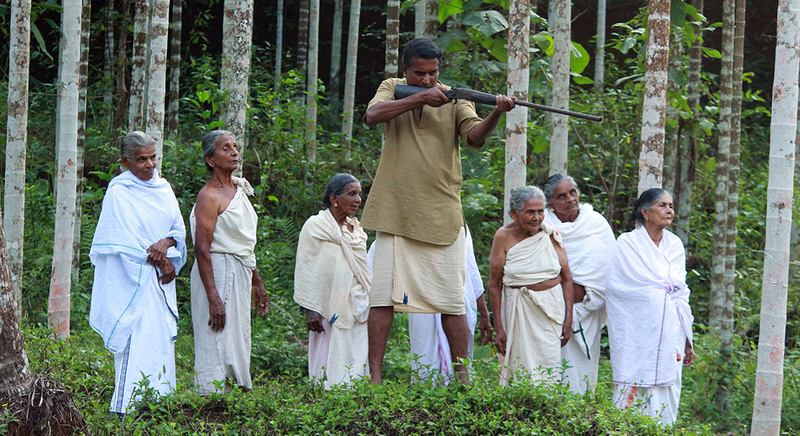 If what animates the first half is Kunjambu’s intense fascination for the bilathi-kuzhal and his relentless pursuit to possess it, the second half is centred around the missing gun and his desperate yearning for it; if it is running, mimicking and pining to get hold of the gun and shoot with it that drives the young Kunjambu’s life, it is passive and silent but persistent and relentless waiting for it in the second half. The only gun we see that he actually holds in both halves is the toy gun carved from wood. The real gun of active and youthful life never figures in the film; it is the absent middle of his life where he was at one with himself, as it were. It is absence or lack, not presence or possession that constitutes the core of any obsession, so, it is the yearning and pining for the object of desire that form the two halves that structure the narrative of his life and desire, and also the film. Vinu employs several elements that mirror each other, in their similarity, imitation and contrast, in both segments. In both halves Kunjambu’s family, daily chores in the house, adventures with his friend and the immediate world outside constitute the narrative setting and action. His childhood is half real and half imagination, where one often finds him swimming in and out of dreams, listening to the songs of his grandmother, lying on her lap. Then there are his outdoor exploits into the fields and the jungle with his friend carrying a toy gun made of wood. In his old age, he is an outsider in the family, no one shows any particular warmth towards him, nor are they in anyway intimidating; everyone goes about their business despite him, as if his presence or absence is of no consequence. It is as if he is living in the cocoon of his obsession. His sons too are busy with their own lives and have little time for their father. Kunjambu still spends his most lively time with his friend who is now a loner reciting verses and poems, and poking fun at others around him. Both of them are drifters struck by the magic of the gun; the wooden toy gun reappears in the second half too as a remnant of their past/childhood and also as a substitute for the real one they have lost or are made to lose. The exterior locations in the second half are the police station where he spends most of the day waiting for the gun, the bus stop or the grocery shop where they while their time away, watching life go by. Everyday rituals like elaborate oil bath at night, domestic chores like grinding and cooking, outdoor activities like peeling and drying of areca nuts and de-husking of coconuts etc happen all around, as if in an endless loop. If the first half ends when Kunjambu finally lays his hands upon the gun, in the second half he is eternally deprived of it, with his sons and police conspiring to it. As we never see him using a real gun, one can only imagine his life with the gun, even references to it are very sparse and passing. So, more than using it, his passion is about possessing it, as is indicated by one poignant moment in the police station, when he recounts a shooting incident. It is about his friend shooting down a monkey and the sight devastating him. Obviously, the gun is much more than utility to him. It is his one and only obsession, the very raison d’être of his existence. It is this narrative of absence that makes Bilathikuzhal a fascinating film, one that invites the viewer to inhabit its imaginary space and experience the melancholic duration of its temporal flow. The film is also significant when one compares its narrative style and visual idiom with the so-called ‘new-gen’ movies made in Malayalam. They all follow the fast, unsteady and impatient style of visualisation and their narratives are predominantly about the here and now, the immediate and the visceral, never allowing the viewer to step back or reflect. In stark contrast, Bilathikuzhal turns the table and works with duration, inviting the viewer into a different kind of temporal experience and spatial dynamics. 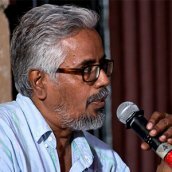 A National-award winning film critic, documentary filmmaker and curator based in Thiruvananthapuram. Has published several articles and books on cinema in Malayalam and English.